Hampered only by the naïveté of youth, Princess Annette is elegant, charming, and beautiful. Obviously, you want the princess to carry your letter. However, she is self-conscious about matters of the heart, and if confronted, will toss your letter in the fire and deny ever seeing it. If you discard the Princess-no matter how or why-she has tossed your letter into the fire. You are knocked out of the round. Always on the prowl for a handsome man or juicy gossip, Wilhelmina's age and noble blood make her one of Princess Annette's friends. While she has great influence over the princess, she makes herself scarce whenever the king or prince are around. 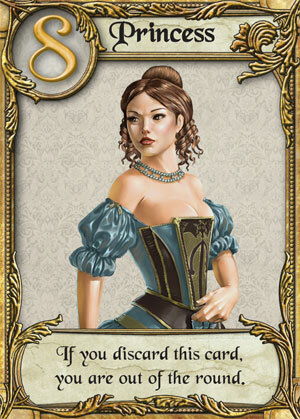 Unlike other cards, which take effect when discarded, the text on the Countess applies while she is in your hand. In fact, she has no effect when you discard her. The undisputed ruler of Tempest... for the moment. Because of his role in the arrest of Queen Marianna, he does not rate as highly with Princess Annette as a father should. He hopes to work himself back into her graces. 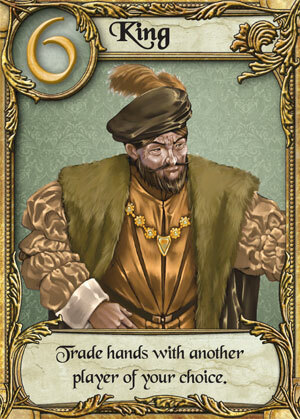 When you discard King Arnaud IV, trade the card in your hand with the card held by another player of your choice. You cannot trade with a player who is out of the round, nor with someone protected by the Handmaid. 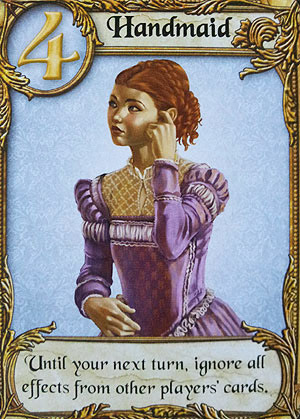 If all other players still in the round are protected by the Handmaid, this card does nothing. As a social gadfly, Prince Arnaud was not as distressed over his mother's arrest as one would suppose. Since many women clamor for his attention, he hopes to help his sister find the same banal happiness by playing the matchmaker. When you discard Prince Arnaud, choose one player still in the round (including yourself). 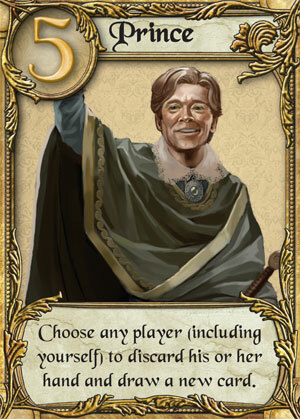 That player discards his or her hand (do not apply its effect) and draws a new card. the deck is empty, that player draws the card that was removed at the start of the round. If all other players are protected by the Handmaid, you must choose yourself. Few would trust a handmaid with a letter of importance. Fewer still understand Susannah's cleverness, or her skilled ability at playing the foolish handmaid. That the queen's confidante and loyal servant escaped any attention after the queen's arrest is a testament to her clever mind. 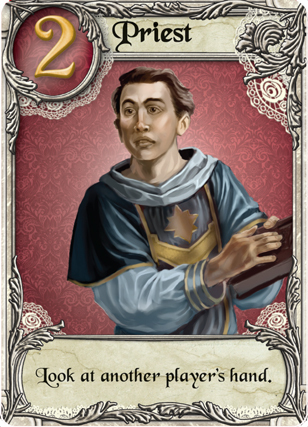 When you discard the Handmaid, you are immune to the effects of other players' cards until the start of your next turn. 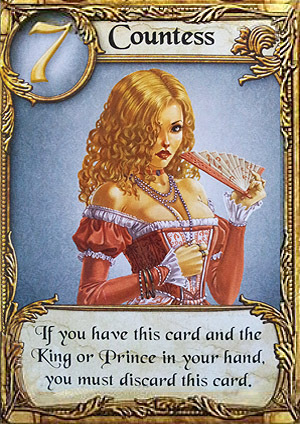 If all players other than the player whose turn it is are protected by Susannah, the player must choose him- or herself if possible. The scion of an esteemed house that has long been a close ally of the royal family, Baron Talus has a quiet and gentle demeanor that conceals a man used to being obeyed. His suggestions are treated as if they came from the king himself. When discarded, choose one other player still in the round. You and that player secretly compare your hands. The player with the lower rank is knocked out of the round. In case of a tie, nothing happens. 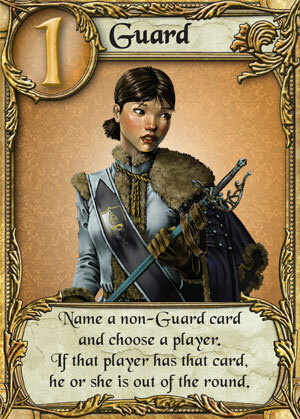 If all other players still in the round are protected by the Handmaid, this card does nothing. Open, honest, and uplifting, Father Tomas always seeks out the opportunity to do good. With the arrest of the queen, he is often seen about the palace, acting as confessor, counselor, and friend. When you discard the Priest, you can look at one other player's hand. Do not reveal the hand to all players. Charged with seeing to the security of the royal family, Odette follows her orders with persistence and diligence… even though her mentor is said to have drowned while fleeing arrest for complicity in the queen's treason. When you discard the Guard, choose a player and name a card (other than Guard). If that player has that card, that player is knocked out of the round. 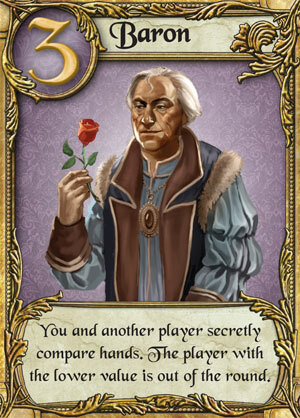 If all other players still in the round are protected by the Handmaid, this card does nothing.